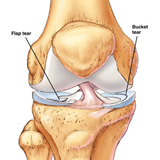 A torn cartilage is often called a torn meniscus. If you have sustained a torn cartilage injury to your knee, then you will have most likely have done it in the following manner. Your injury will have occurred whilst playing sport. At the time of the injury, all of your standing weight will have been placed on the leg that you injured. Your knee will have been slightly bent at the time. Then a twisting movement of your knee joint will have inflicted the injury. You will have experienced a sharp pain in your knee at that point. Your knee will have developed a mild swelling in the hours following the injury. You may have found that you are unable to fully straighten your knee. That is because a piece of torn cartilage is blocking your knee joint from moving correctly. Your cartilage tear can be confirmed with an MRI scan. If your cartilage tear is a mild one, then it may resolve itself without surgery. However, if you cannot straighten your knee, or the swelling is problematic, then you may need to seek surgical intervention. Keyhole surgery is the most common approach used. This will enable your surgeon to firstly determine the nature and extent of your cartilage injury. Your surgeon may then be able to undertake any repairs in the same procedure. However, some cartilage repairs require full surgery.